Contact Fort Lauderdale Bike Accident Lawyers Gerson & Schwartz, P.A. Sunny skies, warm weather, and long beach drives create the perfect scenario for that ride on your motorcycle. However, driving conditions for motorcycles are quite dangerous as Fort Lauderdale’s highly travelled roadways are filled with commuters, tourists, and work vehicles alike. Drivers travelling at fast speeds, making short stops, and quick lane changes can cause accidents and significant injuries for motorcyclists. If you’ve been injured in a motorcycle accident, contact our Fort Lauderdale motorcycle accident lawyers at Gerson & Schwartz for help. For over 40 years, our Fort Lauderdale motorcycle accident lawyers have helped injured clients get on the road back to recovery. How to recover lost wages, where can I get medical treatment, and how to repair the damage to my motorcycle are frequently asked questions. If you’ve suffered injuries as the result of a motorcycle accident and would like to speak to our Fort Lauderdale motorcycle accident attorneys, contact Gerson & Schwartz at (305) 371-6000 for a free consultation. Why Contact a Motorcycle Accident Attorney? Unsure if you have a case? Want more information? Need answers? Contact Gerson & Schwartz at (305) 371-6000 for your free consultation. 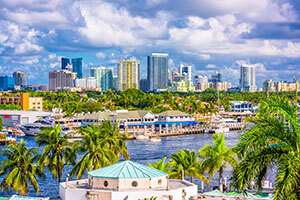 Fort Lauderdale is easily accessible from its local airport, as well as centrally located between the highly travelled roadways of I-95, I-595, US Highway 1, and the Turnpike. With its beautiful beaches and warm weather, Fort Lauderdale is one of the most popular tourist destinations in the country. Fort Lauderdale sees an average of 16 million tourists each year. This, coupled with a population of approximately 180,000 residents, creates a significant volume of cars on its roads each day. The sheer volume of traffic, as well as the high number of drivers who are unfamiliar with the roads, creates dangerous driving conditions for motorcycles. Nationally, there is an 80% chance of injury or fatality in accidents involving motorcycles, compared with a 20% chance of injury or fatality in accidents involving cars. If you or your loved one has been impacted in any kind of motorcycle accident, the Fort Lauderdale motorcycle accident lawyers at Gerson & Schwartz can help. We have helped motorcycle accident victims in Florida for more than four decades. Our motorcycle accident injury attorneys Philip M. Gerson, Edward A. Schwartz and Nicholas I. Gerson are standing by to help you and your family. Just call us for free at (305) 371-6000. We will listen to your story and we will help.